This is a great whisky and just the type I like but to accurately gauge it I need to compare it with a similar sort of whisky, the type I refer to as elegant. The nose on the Farclas is sweeter and I prefer it but it is extremely close, the Glenfiddich is heavier on the nose. The Glenfiddich has a fantastic palate and is on the syrupy side, perfect balance, tightly combined flavours with more in the way of spice. The Farclas is light in comparison to the Fiddich, I think the Fiddich just edges it by a whisker but both are extremely well balanced. Glenfiddich it - Fantastic nose but not as complex on the palate as I remember, still lovely? Tormore sa- A young sherry fizz bomb, as its younger there is more fruit, majestic, old glendronach/Glenglassaugh 1st fill cannot hold a candle to this and their high scores appear bogus in comparison. Karuizawa 67 - Good but like Glendronach aged stuff not in the same league but this is better than any Gledronach IMHO (I use Glendronach merely to illustrate a highly regarded aged sherry monster), well its at least on par anyway. Good stuff more bubblegum notes this time. At the moment the Glenfiddich and Karuizawa are dropping a point as does the Tormore but the Longrow goes up a point., saying that the nose on the Glenfiddich is at 99p so where does this Glenlivet fit in? OMG, yes it is still 97p verging on 98, cannot decide but it is a work of art, you know what I cannot really split the Glenlivet and the longrow but I will give the Glenlivet the nod by a whisker. Holy Cow, what a surprise. Edit after much deliberation I left the KZ at 95 and the Glenfiddich at 96 as the nose on this is the best out of anyhing I can remember, its a 98 nose at least maybe 99 on sweet coffee. The Tormore drops a point almost 2 but its only a single point in front of the KZ. The Longrow goes up a point and well deserved and the Glenlivet stays on top at 98, for now anyway, next week I might think differently remember this H2H is just a snapshot in time. This whisky was so good that the Mother of all head to head tastings I was planning for a few months time will have to be brought forward to this evening, so I can compare the other contenders to this one. I have not got enough left to start off from scratch so while it is fresh in my memory I need to do it now. I have been planning to do a H2H of some top rated whiskies just to see if my palate is in a agreement with some of those whiskies that people score a 100 , certainly 96+. Some whiskies on here have massive scores from people, I just want to know from a personal level if I agree. I have had to keepprice point high so as not to affect the average vote because IB Glenfiddich are as rare as hens teeth. Nose - 3 drops of water make this even jammier, the oak is till there but slightly floral now, still some apricot and chocolate orange. Finish is a little longer than neat, medium length. Elegant is a word I often use to describe old delicate whiskies and this certainly fits the bill. You can smell the wood mixed in with furniture polish, wax and very rich fudge. There are faint notes of peat and cereal and there is some fruit in there like apricot or ripe nectarine and whiffs of orange in the background. First impression is it is very creamy and very dry with the flavours very compact, I think this will need a few drops of water. I cannot believe how creamy it is, the sherry is there from the start but it is a lovely almost flawless type of sherry, not like a brutal Glendronach or Glenglassaugh. The taste is on hot pastries, apricot jam but really dark apricot, almost like a rich breakfast marmalade. 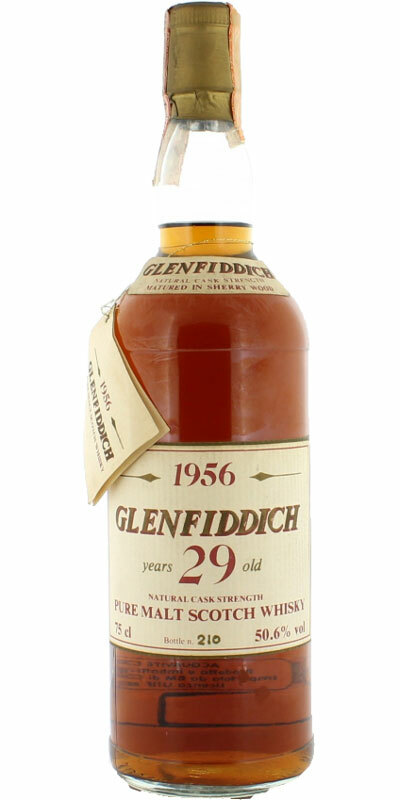 Glenfiddich 29 yo 1956/1985 (50.6%, Intertrade, 384 bottles, sherry) Independent Glenfiddichs are very rare, and we have to rely on old stashes to be able to try some. Colour: gold. Nose: superb, almost magnificent in its extreme yet fantastically subtle oakiness! I think I almost never smelled a whisky that was so woody and so complex at the same time. ‘Anti-plankish’ (what? ), instantly hinting at an old Jaguar (saloon) or maybe a Rolls-Royce (but how would we know?) and then distributing aromas as a machine gun would distribute bullets, that is to say one after the other at a heavy pace. Apricot pie, incense, cigar box, camphor, ginger, wood varnish, beeswax, banana skin, very old rum, leather polish, fresh almonds… And then the sherry comes out, almost brutally, with huge notes of coffee that just ran out of the expresso machine. Superb, very superb. Mouth: ho-ho-ho! Thick, deep, rich, fruity, phenolic and resinous, with once again a lot of oak and once again a beautiful one. An avalanche of dried fruits (figs, bananas, pears, apricots, dates, prunes… Actually, you have them all) as well as all spices (and even a little salt), all that doing ‘the peacock’s tail’ in the most beautiful manner. How rich! Finish: as long as a Neil Young guitar solo, maybe just a tad bitter now (the tannins are big) but with also some very, very ‘funny’ notes of raspberry eau-de-vie that make for an unexpected, yet most pleasant signature. Comments: Intertrade! These people knew their job – and they still do. Stellar old Glenfiddich, now my #1 on the GF list! SGP:663 - 94 points.